Full disclosure: I was a beta tester of the Rogers One Number service, on behalf of one of the software vendors behind the service. I also use it regularly, mostly to answer calls to my mobile smartphone on one of my PC’s but sometimes for outbound calls. Yet I continue to use Skype for its many other features beyond simply making a voice call. About a month ago Rogers launched the Rogers One Number service to much acclaim from several analysts and players in the the IP-based communications space – worldwide, not just in Canada. Their acclaim arises from the perspective of using IP-based communications to provide a service that takes full advantage of the negligible incremental cost of such a service while offering a free differentiating feature to Rogers’s customers. However, today Rogers marketing attempted to allure prospective customers via the promoted Twitter hashtag #Rogers1Number. But the outcome has turned into a public relations nightmare for Rogers. Instead of building awareness for this unique free service for its wireless customers and its features, it has generated a flood of complaints (to put it mildly) from frustrated Rogers customers who are having service issues with their various Rogers services. There’s a marketing psychology lesson there – if you’ve been having customer service issues, customers will take any social networking avenue to vent, especially if you are trying to entice new customers, even for a free service. When I look in retrospect over the entire beta and launch period, this has to be a classic case of marketing FAIL. And, in particular, failure to build appropriate brand awareness. From a technology deployment perspective, Rogers One Number is a major breakthrough in offering customers a unique service built around today’s IP-based communications technology. Renowned telecom analysts such as Dean Bubley and Jon Arnold praised it as a “disruptive” service in recent posts. Kevin Fitchard at GigaOm asks “Is it the future of telco voice?”. Let’s step back and take a look at the offering and, then, how it was marketed. What does Rogers One Number offer? Make and receive calls to/from your PC in addition to your smartphone (iPhone, BlackBerry, Android phone) using the same number. Convenience: User can answer on either the PC or smartphone, depending on which is most convenient at the time call is received. 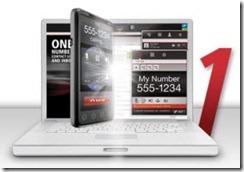 Make free calls to any landline or wireless number in Canada from your PC. Place calls to any landline or wireless number in Canada from any internet-connected PC worldwide at no cost. Switch calls between your PC and smartphone Move from outside, say, office or home without dropping the call. Great benefits, and they’re free, so where did Rogers fail? The disconnect comes because Rogers has failed to go on the offensive to build true brand awareness about Rogers One Number and its benefits prior to promoting it through a Twitter hashtag. On the other hand their customers associate Rogers with wireless phone services, triggering a response from anyone who has encountered issues with their Rogers wireless account. It would not have mattered if Rogers had promoted as hashtags #RogersWireless, #RogersSmartphone or similar, they would have received the same set of responses. The number one reason for this disconnect is the need to educate their customers that Rogers One Number is about the ability to use a PC as a voice (and video) communications platform that is complementary to their smartphone wireless service. While those of us “in the industry” are well aware of the use of PC’s for making calls, there is still a huge audience out there who need to be educated about using a PC for text, voice and video conversations and the ability to handle calls concurrently on more than one device or platform. This is where Rogers marketing has made its major fail. Too much rush to push a service where the target market needs to learn about the underlying user experience rather than simply making calls from a smartphone. This is verified by the fact that none of the responding Tweets ask what Rogers1Number is or mention anything about the service itself. “Knowing how your customers REALLY feel about your services” includes ensuring they are aware of what the service really offers and how to go about taking advantage of it. If anything, this scenario proves that there is a significant portion of the target market who are not even aware of using PC’s for making and receiving calls. Or the ability to make and receive calls concurrently on a PC and smartphone. It’s not a “familiar” or “no brainer” user experience. Here we have an example of putting the cart before the horse. In over six years of following Skype, a key difference from the normal user calling experience is that Skype calls are usually made from PC’s, and more recently, smartphones – not a telephone handset, whether desktop, wall phone, cordless phone or plain mobile phone (voice and text only). A Skype account can be used concurrently on both platforms; Skype users are well aware of the experience of making calls on a PC or mobile smartphone. Grandparents only learn about Skype when they learn they can see their grandchildren grow up, even if they live a continent or oceans away. Parents learn about it when their children head off to college in another town. Small businesses learn about it when they learn they can deal worldwide at little or low cost. Rogers needs to work on educating their consumer market, through their advertising and promotions, not just “pushing” the brand name. A more appropriate promoted Tweet would have been “With #Rogers1Number, make voice and video calls from your smartphone or PC. Learn more about this free service here: http://t.co/sGXFm0jl”. (<140 characters). I meet several of their social networking team at a monthly event that Rogers, amongst others, sponsors. These a real humans who want to flag problems and get assistance. Even today I see Mary @ Rogers and Melanie @ Rogers, amongst others, attempting to establish a dialogue with some of the responders. Bottom line: The challenge of social marketing is to blend it into an overall marketing campaign. In this case social marketing was used to push a service but the response has been an outpouring of grief. Meanwhile the target market base needs to be educated about a new user experience and its benefits. However, can this be turned into cleaning up customer experiences? Only time will tell. Update Friday evening: Rogers VP Social Media, Keith McArthur responds on Rogers Redboard: Our take on today’s Twitter trend. Twitter “bashtags” are often symptomatic of problems at the very core of an organization – the brand promise and strategy do not align with the customer, but rather with the products that the company sells. For these organizations, it’s all about pushing more product and selling higher margin goods and services. ….. As companies realize that the only way to differentiate in this commoditized, digitized world is by creating unique, wonderful experiences for their customers (stories and memories that can be shared, by putting their customers at the centre of their businesses), and by creating a culture where employees are empowered and proud to wear the brand on their sleeves, will we see a reduction in the number and frequency of Twitter promotions that backfire. Rogers needs to move from a product-centric focus to a customer-centric one; such a change requires direction and leadership from the C-level executives. Full disclosure: I have been a Rogers customer for all their services since 1986 (when Bell had a terrible cell phone service). Over time there have been glitches but more often than not I’ll learn about new cost savings and enhanced services through customer service calls that were initiated to solve a problem. Last week I went to a Rogers store to upgrade my Internet modem and learned that I could save 10% of my combined cable TV and Internet bill by signing up for their new Rogers Netbox service. I now have a much better overall cable TV service and get to keep my Rogers Ultimate Internet service. Again it was a matter of educating me as a customer rather than pushing something I may not need. My other secret – I treat all Rogers personnel as if they are “my” customer, not a foe; they are humans also. Often they volunteer helpful information in addition to resolving my issue.